This is a follow-up to my previous post on the comic book series, Grendel. Matt Wagner finished his run on the original Grendel series with War Child, though both Hunter Rose and Grendel-Prime appeared in team-up books with Batman in the early 90's (the first one of which was released on the exact same day that Grey Legacy #1 appeared). 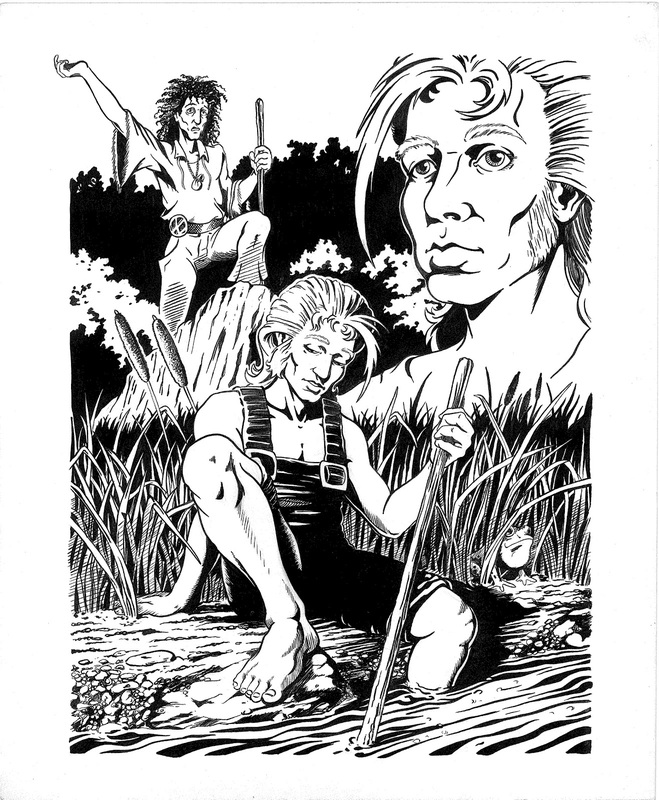 He has since created several new Hunter Rose stories in various miniseries. But, for the most part, the main story of Grendel was through. By the end of the series though, Wagner had created a world with a vast history, with room for a lot of untold stories. He decided to allow other creators to play in his universe. 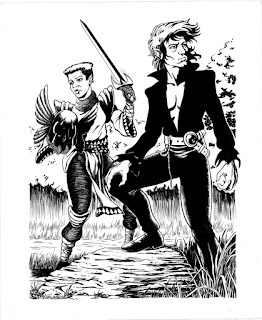 Over the course of several years readers were treated to a series of miniseries called Grendel Tales. Each story was written and drawn by someone other than Wagner, but set in the world of Grendel. The quality of these varied, but there was some stellar work by a number of people who went on to continue to work in the industry, James Robinson of Starman fame among them (he's also the writer on DC's upcoming Earth Two series). I'm not going to discuss these in detail, though I will say they are worth reading if you're into the Grendel mythos. For more info check out the Wikipedia article at http://en.wikipedia.org/wiki/Grendel_Tales#Grendel_Tales. As a footnote, I'll mention that I had a review of Grendel: Devil May Care published in the nationally distributed magazine Kulture Deluxe. As I've mentioned before, Fred and I were sending Grey Legacy mini-comics to Wagner on a pretty regular basis. Matt always wrote back with encouragement. He was always good at giving newcomers a foot in the door. Many of his collaborators on Grendel and Grendel Tales were unknown at the time. Apparently our comic impressed him enough that he asked us to submit a proposal for a Grendel Tales series. We were pretty ecstatic, as you might imagine. He sent us a copy of the “Grendel Bible,” which contained his guidelines for the universe and the types of submissions he was looking for. In the wilderness and ruins of what had been the eastern United States an uneasy alliance of humans and vampires begin to follow the peaceful teachings of a young charismatic mystic named Huck. This becomes a movement that begins to migrate west and eventually comes into conflict with the empire of the Grendel Khan. We used the symbolism of Baptism pretty overtly. Wagner's vampires were subject to the classic weakness of running water, so as a symbol of pain and sacrifice this worked really well. The story was an exploration of the ideas of religion, faith, tolerance for others, and peaceful coexistence set against the backdrop of a world based on the spirit of violence. and the former shaman of their community. of the provincial life and left home to join the Grendel corps in the west. These two are part of the vampire coven who live near Huck's human settlement and become part of the human/vampire coalition. The first is Petra Moon, a former Grendel who had been turned into a vampire. The second is Haller, the leader of the vampire community, and Huck's greatest supporter. 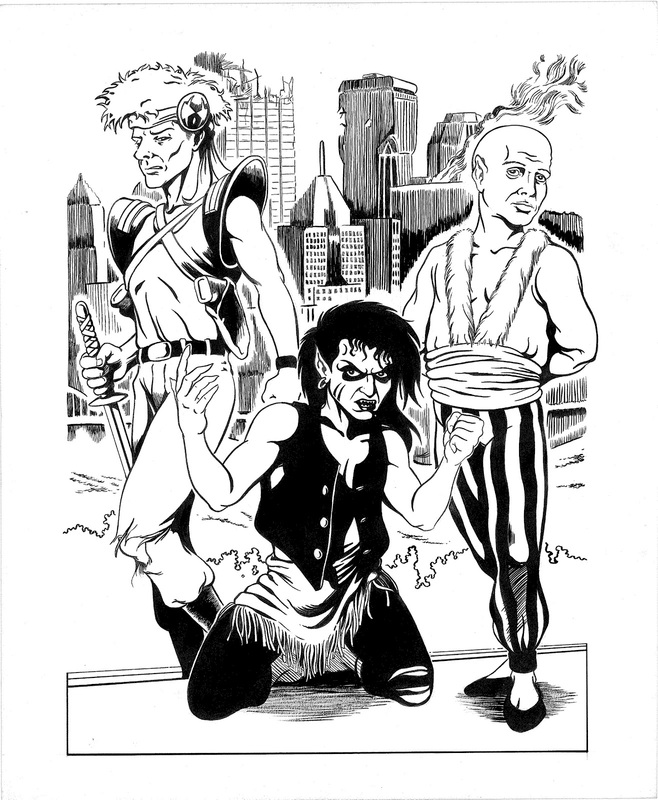 These are other vampires of Haller's group (yes, that's a ruined Pittsburgh skyline behind them). Our timing couldn't have been worse. We received a post card from Matt telling us he had received our materials, and while he liked them, the copyright to Grendel and Mage were coming under dispute. I don't know all of the details, but the original publisher, Comico, had been bought out and the new owners believed that meant they now had the rights to everything Comico had published. The original creators for Comico believed that they had always been published with idea of creator rights in place, meaning they all owned their own work. This legal battle went on for years and Matt was unable to publish any Grendel or Mage-related material. The good news is that in the end, Wagner and the others all triumphed and regained their rights. 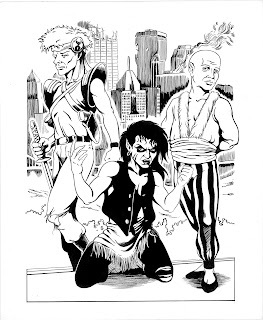 The bad news, for us anyway, is that by the time this happened the comics industry had moved on and there was no call for new Grendel Tales stories (and we had come to the end of our Grey Legacy experience and weren't doing comics by this point either). Matt eventually told new tales of Hunter Rose, and Mage: The Hero Defined, the second in his proposed Mage trilogy finally appeared. We were disappointed, of course. This is one of the great “Might-Have-Beens” in my life. But timing is everything, and life moves on. Both Matt and Bob have always been very friendly and remembered me on the few occasions we have met since. All Grendel related concepts and images are copyright Matt Wagner. 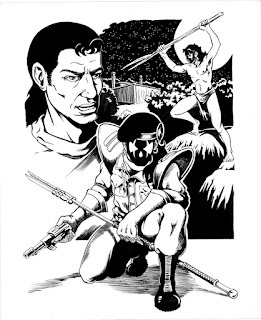 The other characters are copyright Wayne Wise and Fred Wheaton. It's been a Banner Week! New 5-star review for Scratch on Amazon!